Dr. Himanshu Patel has been in pediatrics for over 26 years. Dr Patel received his MBBS degree in 1986 from the M. P. Shah Medical college in India. After completing his Residency in Pediatrics in 1989 he immigrated to USA. In 1990 Dr. Patel moved to New Jersey. He completed a residency in pediatrics at University of Medicine and Dentistry(UMDNJ) of Newark New Jersey in 1994 and was Pediatrics Emergency room attending till 2002. He has received best attending award from UMDNJ. 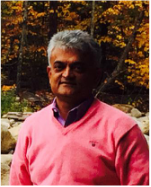 While being attending at UMDNJ, in 1996 Dr Patel started his solo Private Practice in Somerset NJ. During the years thousands of patients with diverse medical problems were treated. Dr Patel is board certified by the American Board of Pediatrics and is a fellow of the American Academy of Pediatrics. He has admitting privileges at Robert Wood Johnson University Hospital - Bristol-Myers Squibb Children's Hospital, The Children's Hospital at St Peter's University Hospital and Princeton Medical Center. Dr Patel and his wife lives in New Jersey. They have two sons. As many of you may already know that about 18 months ago I sustained a head injury that caused an intra-cranial bleed and a severe concussion. Cognitive and problem-solving abilities where affected. I received rehabilitation therapy and in the past few months I attempted to return to work a few times. After these experiences I concur with my doctor and therapist that I am not up to par with my pre-accident abilities. The first tenet off medicine is “do no harm”. Therefore I decided that it’s time to retire from the practice of medicine. It is not with a light heart that I make this decision. I thank you for the many years that you have entrusted the health of your children in my hands. It was an honor and a privilege to take care of your children. I hope I did my best. It was always a pleasure to interact with the children. I will miss them greatly. I am leaving knowing that I entrust the care of your children in very competent hands. No two physicians are the same. It may take some time to get used to the style and personality of a different doctor. But I know that the doctors in the practice are knowledgeable and caring. I am convinced that the care from now on will be not less professional and attentive. My grandchildren and grand nieces continue to be patients of Drs. Praburam and Quraishi. I thank you for the many years of trust that you bestowed on me. I wish you further good health and enjoyment from your children as you see them growing up. Dr. Deborah Chen earned her medical degree at Southwestern Medical School in Dallas, Texas and completed her residency at New York Hospital, Cornell Medical School. Her first two years of pediatric residency were at the University of Chicago, Hospitals and Clinics in Chicago, Illinois. She got her undergraduate degree in biochemistry from Rice University in Houston, Texas. Dr. Chen is board certified in pediatrics, a member of the American Academy of Pediatrics, and Middlesex County Medical Society. She has been at New Brunswick Pediatric group since completing her residency in 1986. For the past 20 years, our physicians have time and time again proven themselves to be steady and dependable healthcare providers. We pride ourselves in retaining patients quite literally from the day they are born to adulthood. So much so that many of our earliest patients return to us with children of their own! Over the years, we have witnessed the joys and pains of watching our patients grow with our care and your tutelage. Becoming a part of that process has been a joy and an integral part in providing comprehensive and efficient care. We make an effort to provide the most appropriate and effective care at all times. Occasionally you might not like what we have to say because our doctors are direct and honest, however we guarantee that our intentions are entirely focused upon your child's well-being and quality of life. In the same sense, we believe in trust as well as faith. Many of our efforts encircle building trust between ourselves and our patients families so they understand where we are coming from. At the same time, faith is just as important to the way we work. Faith in our services and well as the belief that your child will overcome any illness when we work together. Through coming together and seeing eye to eye, our doctor-patient relationships have become second to none. pediatric medicine for eleven years. She is certified with the American Board of Pediatrics. Special Interests: ADHD, Dermatology, Behavior and Learning issues and Obesity. daughters as well traveling. She has admitting privileges at RWJ, St Peters and Princeton Medical Center. Dr Prabhuram has been practicing pediatrics in New Jersey for several years. at new York Medical college pediatric residency at Metropolitan hospital, NY. Currently resides in New Jersey with her husband and two kids. Dr. Quraishi is a board certified, energetic and passionate pediatrician committed at providing quality healthcare to every child at every visit. She graduated from the Aga Khan University Medical College in Pakistan in 2009 and completed her pediatric residency from Newark Beth Israel Medical Center in 2016. Prior to joining Central Jersey Pediatrics in 2017, she worked as an emergency room physician at CHOP at St. Mary’s Medical Center in Langhorne, Pennsylvania. Dr. Quraishi enjoys traveling with her husband and 2 children. Dr. Sheba Gul has been in the field of Pediatrics for over 10 years. She has been with Highland Park Pediatrics since 2000. Dr. Gul completed her Pediatric Residency at the University of Dentistry and Medicine of New Jersey at New Brunswick. Dr. Gul studied medicine at the DOW Medical College at the University of Karachi, after which she served as a house officer at the Civil Hospital in Karachi. Dr. Gul is Board accredited by the American Board of Pediatrics, is a fellow of the American Academy of Pediatrics and has attending privileges at both Robert Wood Johnson University Hospital and Saint Peter's University Hospital. She and her family live in New Jersey. Currently she is on Sabbatical leave to take care of her family.